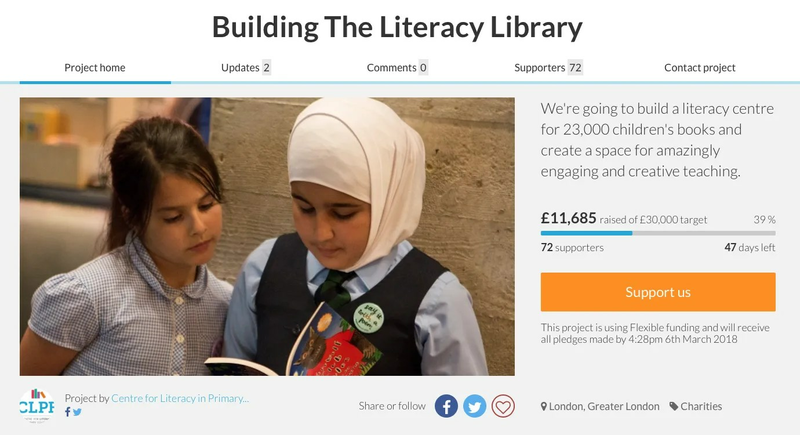 Earlier this week the Centre for Literacy in Primary Education (CLPE) launched an ambitious and timely campaign to raise funds aimed at refurbishing their central London headquarters with the creation of a permanent collection of children’s books to be used to support their work. The announcement of the campaign (made on Monday 15th January) ran in key trade magazines The Bookseller and BookBrunch, which helped get things off to a great start. Louise Johns-Shepherd, CLPE’s CEO, has been interviewed on London Live. As key champions of children’s literacy, the CLPE hopes that creating a Literacy Library will significantly help it continue to provide top-class training and resources for teachers, as well as providing a creative, engaging and accessible hub to be used across the children’s books industry. As a charity, CLPE has long been instrumental in providing key support to educationalists through training and materials, and is responsible for the widely recognised Power of Reading and Power of Pictures projects, as well as the acclaimed CLiPPA (Centre for Literacy in Primary Poetry Award). Their literacy centre, rather fittingly a former school near Waterloo station, is used widely for events and meetings by other charities that often don’t have their own in-house facilities. The refurbishment is designed to allow a dedicated and permanent space for a collection of 23,000 children’s books, chosen by the CLPE’s in-house experts, creating a comprehensive collection of titles for all primary ages that can be browsed and read with a view to their use in the classroom. Funds raised will also allow for the space in the centre to be enhanced for events, and as a fully resourced venue for large or smaller meetings. Organisations and individuals are invited to pledge any amount between £100 and £10,000 in return for having a bookshelf, bookcase, alcove or collection at the centre dedicated to them. High profile names, including BookTrust, Beanstalk and key authors have already lent their support to the campaign. The Crowdfunding campaign can be found here, where it is also possible to donate smaller amounts. Having seen the inspiring work CLPE do to help schools to use drama, poetry and stories in creative ways I fully support their bid for improving the building. It’s so exciting to think of their library being able to display all their 23,000 books, and that it could become a nationally renowned training centre for teachers, librarians and literacy charities. Phil Earle has just been appointed the new online Writer in Residence for children’s reading charity, BookTrust. He takes over from Sita Brahmachari, and is the 13th BookTrust writer is residence, hope he’s not too superstitious! via Phil Earle is the new BookTrust writer in residence | Children’s books | The Guardian. In England, reading scores rank among the lowest in the Western world – 22nd out of 24 countries. It’s time to take a hard look at how we’re teaching reading. Methods matter. So do the findings of literacy research. We have almost a quarter century of studies that document how literacy blooms wherever students have access to books they want to read, permission to choose their own, and time to get lost in them. Enticing collections of literature—interesting books written at levels they can decode with accuracy and comprehend with ease—are key to children becoming skilled, thoughtful, avid readers. via 'It's time to take a hard look at how we teach reading' – Telegraph. The price of books rose by 12.8 per cent in the three months to the end of September and an average of 7.4 per cent over the whole of 2014, as tracked by the Office for National Statistics. That is the highest rise since ONS records began in 1997. The figures, which include hardbacks, paperbacks and ebooks across a range of outlets online and on the high street, reflect a new attitude among some book buyers, believes James Daunt, managing director at 276-store chain Waterstones. ‘The ebooks market was embraced very strongly at first, but it now looks like most ebook buyers are also buying physical books,’ he said. ‘The value of having a book sat on your desk, that you can pick up or lend to someone, has come back. It would be nice to say it was about consumers supporting local bookshops, but I’m not sure that is the case. ‘But as a company – and we are a large part of the high street market now – we are getting much better at selling hardbacks and we’re selling more, which hasn’t been the case for a long time. ‘We’re also seeing strong growth in children’s book sales. There was an expectation that children from the ages of nine to 12 would increasingly want to read on digital readers, but that doesn’t seem to have happened,’ said Daunt. via Record rise in book prices as readers show appetite for printed pages | This is Money. via THE BOOK SHOW – Episode 10 (Final) – YouTube.